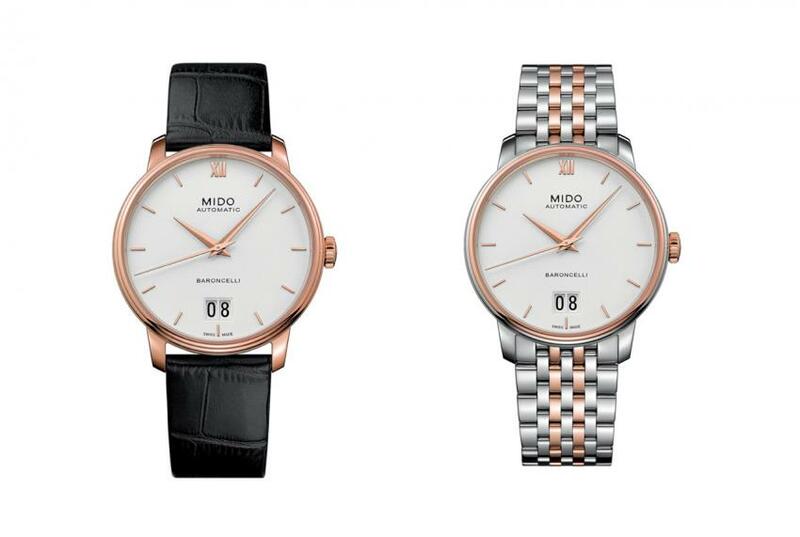 In the past year, Mido is expanding in Canada, with more prestige retailers being added to their list of points of sale, yet we still have a lot to discover about this amazing brand. 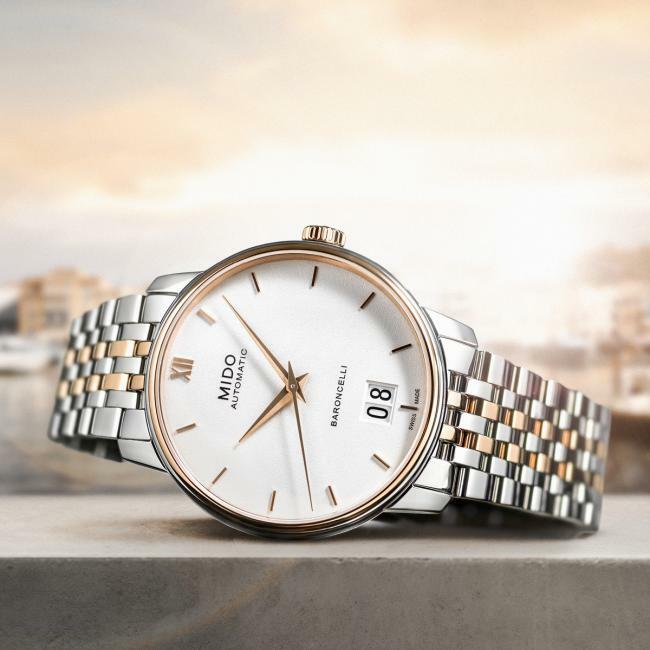 Georges Schaeren found Mido on November 11, 1918, the same day as the armistice, therefore 2018 is an important date for this Swiss brand (part of Swatch Group) and they celebrate it by equipping their Calibre 80 movement with a big date complication. Unlike a common date complication with a 31-day date wheel, big date complications have two closely positioned date wheels, one for the first digit (0, 1, 2 and 3) and another one for the second digit (0 to 9). As the two discs don’t turn at the same rate, it takes a more complex mechanism. This is why I always associate big date complications with high-end watches. Yet the Baroncelli Big Date is priced as an entry-level watch — US$1080 on a bracelet or US$1000 on a strap. Since we’re at the movement, I should mention that the Calibre 80 base movement received its name from 80-hours of power reserve it packs. Here is a dress watch you can leave in your watch box over the weekend and on Monday it will still be running. The design is just as exceptional as the movement. Its curves were inspired by the neoclassical style of Milan’s Galleria Vittorio Emanuele II. 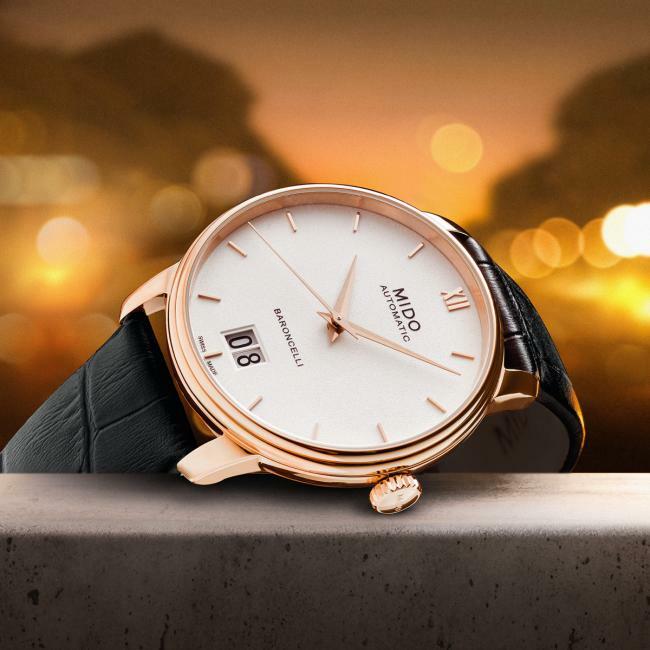 The 40 mm polished stainless steel case has a rose gold PVD coating and the double gadroon bezel together with the beautifully curved lugs, convey an elegant style to the Baroncelli. The white grained dial is matched with polished applied indexes and a Roman XII, while the big date windows have a perfectly balanced position at 6. The hour and minute hands are quite interesting too, they are double sided — one side is sandblasted, while the other is diamond-cut. There are a total of seven version of the Baroncelli Big Date, with or without PVD coating, on a bracelet or on a strap. Find yours at the nearest authorized dealer or on www.midowatches.com.